London’s first Community Land Trust providing genuinely affordable homes in London and keeping them affordable in perpetuity. London CLT was born out of the community organising efforts of Citizens UK in response to the need for genuinely affordable homes in London. London CLT is registered as a Community Benefit Society and is governed by its members. Anyone who lives in London can buy a £1 share and become a member. This gives a vote at the AGM, and the ability to stand for election to the board. The prominent former St Clements hospital site became the focus of campaigns by Citizens UK and London CLT members in 2009. The Greater London Authority, who owned St Clements, agreed to explore possibilities for a CLT on the site. The GLA ran a competitive bidding process for the site in the early 2010s. London CLT was part of a consortium led by Igloo Regeneration. Their bid included a widespread community-led design process, and genuinely affordable homes in perpetuity. The consortium lost the bid, however the support for a CLT, meant the GLA asked the successful developer, Galliford Try, to see if they could work with London CLT. A partnership was formed after several exploratory conversations. The site was developed by Linden Homes, part of the Galliford Try group. The scheme provides 252 new homes. The section 106 planning obligation required 35% of these to be affordable, including 58 for social rent managed by Peabody, and 23 Community Land Trust homes. The freehold of the site was to be transferred to a community foundation which collects ground rents for charitable purposes. London CLT held community design sessions with the developer’s architects, John Thompson & Partners to develop local people’s ideas for the site. The CLT also looked at ‘meanwhile uses’ on the site before the homes were built and held the Shuffle festival which uses culture to bring people together. Providing genuinely affordable homes and keeping them affordable in perpetuity required a unique solution. London CLT bought each home through a back-to-back mortgage arrangement once they were built. Essentially, this means each resident’s mortgage is used by the CLT to buy each home, meaning no borrowing was required by the CLT. The sale price of each CLT home is directly linked to median incomes in Tower Hamlets, not their market value. This resulted in £130,000 for a 1 bedroom flat, £182,000 for a 2 bed and £235,000 for a 3 bed. This is around one third of their market value. The CLT residents can sell the property on to another household identified by the CLT at any point, but only at a price linked directly to local incomes. This arrangement means that residents buying with up-front discount receive a diminished financial return when they sell. It removes speculation from the market and keeps all 23 homes permanently affordable by local people. The first CLT residents moved in 2017. An independent CLT panel selected the home-owners, taking account of housing need, local connection and ability to secure a mortgage, as set out in the CLT’s allocation policy. Each household raises their own mortgage, and buys the home fully. 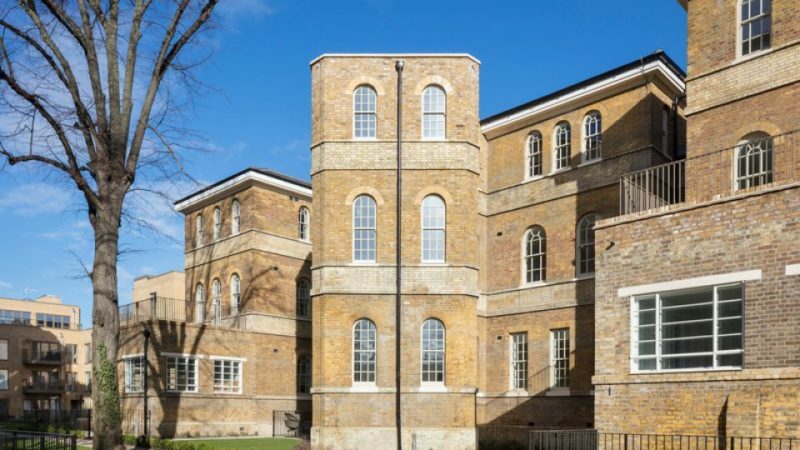 The CLT is working with residents to create a cohesive community at St. Clement’s, and to make use of the community space in the John Denham building for events and activities. Residents will take a leading role in how the site and community space is run. Shuffle has become a successful festival and continues in the neighbouring Tower Hamlets Cemetery Park.